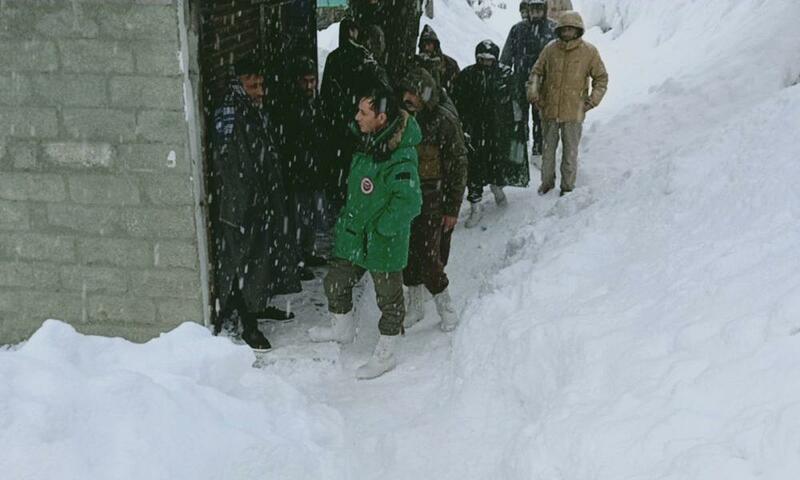 Srinagar, Feb 7 : Jammu and Kashmir Police on Thursday evacuated 22 families from an avalanche-prone area in Gund area of Kangan in central Kashmir's Ganderbal district to safer places after heavy snowfall. In view of the heavy snowfall and apprehension of snow avalanche at Khan Mohalla in Gund in Ganderbal district, police launched an evacuation process under the supervision of Sub-Divisional Police Officer (SDPO), Kangan, Tahir Ahmad. After strenuous efforts, police evacuated 22 families consisting of 124 members to safer locations, said a police official. He also said that the affected families were shifted to the nearby government school. Meanwhile, Sub-Divisional Magistrate (SDM) of Kangan issued an advisory to the general public of Kangan. While advising the people not to venture out in the avalanche-prone areas of the Sub-Division, he ordered all vehicles plying on Kangan to Gagangeer and Kangan to Wangth Narnanagh and Chatergul areas to use anti-skid chain kits for travel.